Spiral Manufacturing Co., Inc. single-wall, rectangular duct fittings are factory fabricated to furnish you with a high-quality line of products in a broad range of standard sizes. To minimize field assembly costs, rectangular duct is supplied in lengths up to ten feet. Longitudinal seams are typically manufactured with Pittsburgh Lockseam or Button-Punch Snap Lock. In addition, all applied duct connectors are available in economical Ductmate 35 traverse duct connectors, Slip & Drive slip joints, and four-bolt connectors. Rectangular ductwork is typically crossbroke (to increase rigidity) and can be shipped completely assembled or knocked down. Spiral Manufacturing Co., Inc. standard rectangular products are fabricated to meet or exceed SMACNA duct construction standards. In addition to standard, we can custom fabricate rectangular ductwork for commercial and industrial applications according to your specifications. Drive Slip – Ends of ducts inserted under cleat. For narrow sides of ducts that are 18″ or less. Drive slips that are 19″ thru 30″ must be reinforced with 1″ x 1″ x 1/8″ angle. 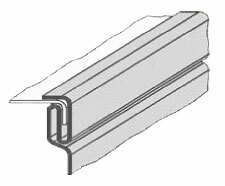 Hemmed “S” Slip – Ends of ducts inserted into open ends of “S”. Use wide wide sides of small ducts. Edges hemmed to produce stiffness. Standing “S” Slip – Similar to “S” Slip except fpr standing edge which is formed to provide reinforcing. The standing leg is folded to two thicknesses for stiffness. Ductmate 35 – Traverse duct connection systems consist of installed roll-formed flanges. Corner pieces, gaskets, and cleat complete the joint assembly. The flanges attach to duct end and have integral mastic which allows the flange to seal itself to the duct. Corner pieces add rigidity to the flange, hold the ductwork together and provide a sealing surface for the gasket. The gasket serves as a seal between the flanges. The cleat insures even compression of the gasket along the length of the flange. Companion Flange or Angles – Angle frames are riveted, bolted or welded to duct ends and are then bolted together with gaskets or caulking to prevent air leakage. Recommended for use where duct sections must be removed periodically. Angle iron flanges are standard mild steel. Galvanized are available along with punched holes. Bolt Hole Centers (BHC) need to be specified along with angle iron size.